Sorry... the 2017 Toyota Highlander Hybrid is no longer being sold as new. Instead, take the first step to a great deal on 2019 Toyota Highlander Hybrid with a free price quote! The Highlander is a three-row SUV that competes with the Honda Pilot, Ford Explorer, Hyundai Santa Fe. It is available as a hybrid and traditional gas-powered SUV. Toyota is boosting the Highlander's performance and efficiency with a new engine and transmission for 2017. The three-row SUV also gets more standard safety equipment. The list of changes is more than just mechanical and includes a mildly updated exterior and interior for 2017, plus an SE trim level that adds unique packaging for a sportier experience. 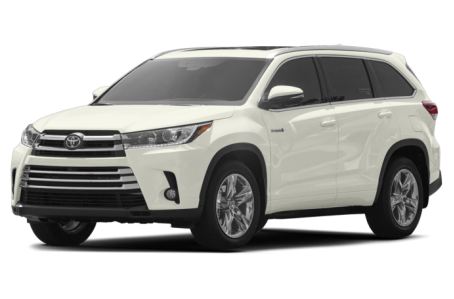 The Highlander Hybrid isn't left out of the fun; for 2017 it receives the new engine plus new LE and XLE trim levels rounding out a hybrid lineup previously made of the top Limited and Platinum trims only. The Highlander's redesigned upper and lower front grilles wear unique finishes and headlight housing colors dependent on trim level. LE, LE Plus and XLE grilles are painted silver and Limited and Platinum models are chrome. The new SE trim's darker grille treatment mirrors the dark headlight housing and roof rail colors, while SE-specific 19-inch wheels use black-painted highlights between silver spokes. One of the Highlander's already stand-out interior features is its multimedia shelf; it'll likely be used more frequently for 2017 with the addition of two more USB ports up front and two in the backseat for a total of five USB ports inside the Highlander. Newly available brown leather joins the list of interior colors on the Limited Platinum trim. The SE's unique interior appointments include black leather seat trim with silver stitching and patterned seat inserts, plus matching dashboard and door inserts. The top Limited and Limited Platinum trims now will offer a bench backseat instead of just captain's chairs as in 2016, making seating for eight available across the Highlander lineup. Power, performance and fuel economy, says Toyota, are improved for 2017 with a new direct-injected 3.5-liter V-6 and new eight-speed automatic transmission. The outgoing combo is a 270-horsepower, 3.5-liter V-6 and six-speed automatic transmission rated at 19/25/21 mpg city/highway/combined or 18/24/20 mpg for front- and all-wheel-drive models, respectively. We won't get specifics of the new powertrain until closer to the 2017 Highlander's fall launch, according to a Toyota spokesman. The Highlander Hybrid also receives the new V-6, though its continuously variable automatic transmission carries over. The new eight-speed is offered on all trim levels except the base LE, where the four-cylinder with six-speed automatic is standard. The LE is front-wheel drive only while gasoline LE Plus, XLE, Limited and Limited Platinum trims can be equipped with front- or all-wheel drive. Highlander Hybrids continue as all-wheel drive only, using an electric-powered rear axle for on-demand all-wheel drive traction. 22 of 22 (100%) consumers said they would recommend this vehicle to a friend.